So I'm 2 for 2. At least in my mind. And it is a beautiful mind. 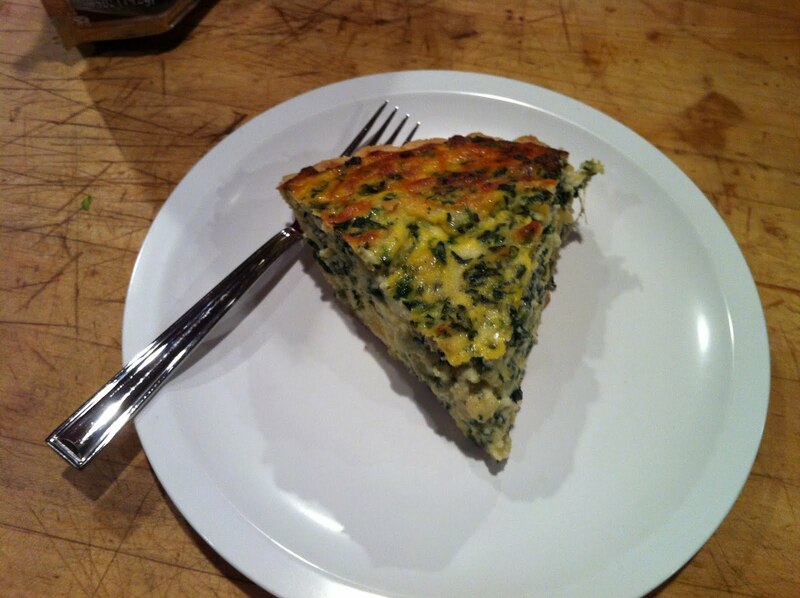 I did another new meal last night, Spinach and Ricotta Pie. I'm not sure why it's called that. I mean sure, it has spinach and ricotta in there, but it has eggs, mozzarella and Parmesan too. I think it has more mozzarella than it does spinach. ...and no, it's not quiche, as Denton called it when he walked through the door. I'm a manly man and you know we don't eat that. It's pie. PIE. Of course, you say 'quiche' and I think of Sixteen Candles with Long Duck Dong at his first meal with the grandparents and the grandkids. Long Duck Dong: Appetizing food fit neatly into interesting round pie. Long Duck Dong: How do you spell? Grandpa Howard: Well, you don't spell it, son. You eat it. If there is any criticism, it is that the posted recipe isn't necessarily complete. In the instructions it says to saute the onions and garlic, but in the ingredients it never says garlic, let alone how much. I used three cloves, minced. It worked. Also in the instructions, it says to mix the mozzarella, parm and eggs together, but never mentions the ricotta. I took my chances and mixed that in as well. I wasn't wrong. I would have taken more pictures, but I get so into the cooking and prep process, I forget to take pics as I go along. So I only took like three or four. 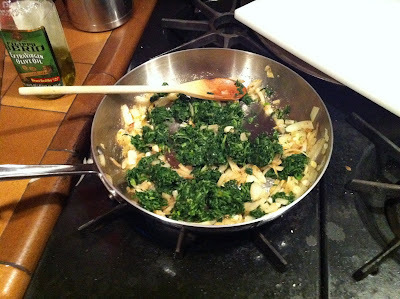 Here's a quick shot of me sauteing the onions, garlic and spinach. Here is the finished product. Nice, huh? I think so.....and not just because I made it. I'll fully admit, I used a store bought frozen pie crust. I wasn't getting home from work and making dough and such. It was so not going to happen. And the mixture just is heaping when you put it into the shell. I thought it was way too much and that it would overflow, but it did not. It cooked up perfectly. And trust me, you only need one piece of pie to feel extremely full. Again, Bo doesn't say how many it will serve, but I think it would feed six folks nicely. I can add this to my repertoire. Easily. ....and it's not quiche. Cuz I'm a man (yes I am, yes I am). Give me a little quiche, will ya, huh? It looks like a meal fit for a Queen! Oops, I mean manly man. 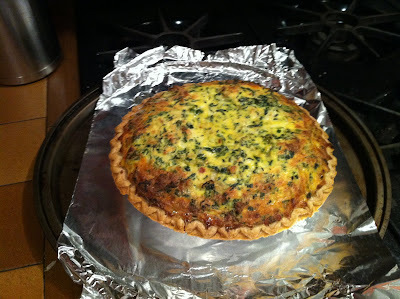 it's quiche...embrace your manly manhood and admit it! Looks great!!... your pic will inspire us to eat our spinach. I think saying your are eating pie is a little sexual like mowing the law. Perhaps it is just better to say you are owning up and eating a lovingly prepare quiche while exposing your manly quiff. We're on the same thought wave this week. We both mentioned "Sixteen Candles" and Long Duk Dong. And I think it is technically not a quiche because it does not have cream in it. The ricotta makes it a lot fluffier than if it was cream. Also probably what kept it from spilling over. next time you need a quick pie crust, instead of frozen, try the pillsbury ones in the dairy case. They are cold but not frozen. just unroll them. They are flaky and taste much better than the frozen. Even acceptable to us southerners.